Open Culture stories at Techdirt. 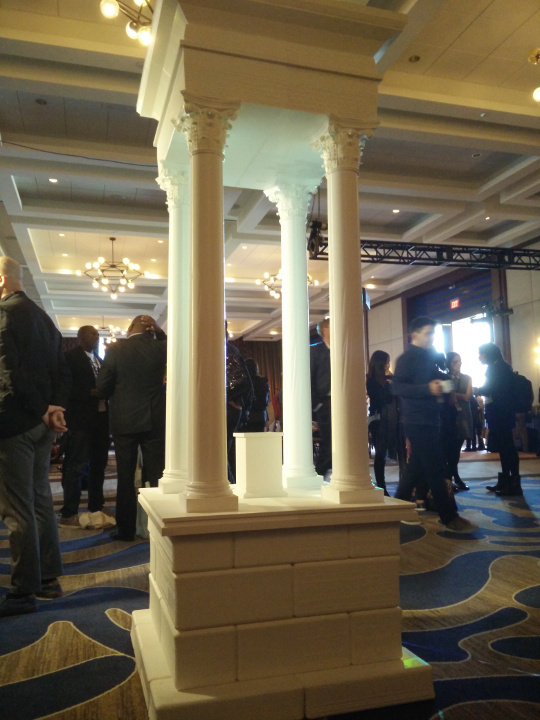 stories filed under: "open culture"
Creative Commons launched its 2017 Global Summit today with a rather moving surprise: a seven-foot-tall 3D printed replica of the Tetrapylon from Palmyra, Syria. For those who don't know the tragic situation, Palmyra is one of the most historic cities in the world — but it is being steadily destroyed by ISIS, robbing the world of countless irreplaceable artifacts and murdering those who have tried to protect them (the folks at Extra History have a pair of good summary videos discussing the history and the current situation in the city). Among ISIS's human targets was Bassel Khartabil, who launched Syria's CC community several years ago and began a project to take 3D scans of the city, which CC has been gathering and releasing under a CC0 Public Domain license. He was captured and imprisoned, and for the past five years his whereabouts and status have been unknown. As the #FreeBassel campaign continues, Creative Commons is now working to bring his invaluable scans to life in the form of 3D-printed replicas, starting with today's unveiling of the Tetrapylon — which was destroyed in January along with part of a Roman theatre after ISIS captured the city for a second time. This isn't the only such project — the Institute of Digital Archaeology and UNESCO unveiled a replica of part of the Temple of Bel in London last year — and these combined efforts are a critical bulwark between ISIS and its goal of eliminating this part of our shared cultural history. You can read more about CC's project — including status updates on the other artifacts, monuments and architecture that they are reproducing — on the #newpalmyra website (at the time of writing it still lists the Tetrapylon as "coming soon", though that will likely change shortly). Much of this weekend's summit is likely to revolve around the ongoing tension between open culture and intellectual property regimes, but I can't think of a better way to kick things off than with something that even the staunchest copyright maximalist can surely agree with: that the treasures of this 2,000-year-old city belong to us all, their destruction is a travesty, and the ability to preserve them even in some small way is a triumph of technology and the cultural commons. Should Creative Commons Drop Its NonCommercial & NoDerivatives License Options? While we're big fans of Creative Commons in general, for many years, we've raised questions about some of the licenses/clauses -- with the NonCommercial one being of particular concern. Almost four years ago, we worried about the very blurry line between what was commercial and what was non-commercial, and how trying to separate them out in a license could lead to serious problems. Two years ago, Nina Paley also argued about significant problems with the NonCommercial licenses, and how they actually hurt Creative Commons itself in the long run by creating branding confusion. In particular, many people think that all CC licenses bar commercial use, even though that's not the case at all. The two proprietary clauses remaining in the CC license set are NonCommercial (NC) and NoDerivatives (ND), and it is time Creative Commons stopped supporting them, too. Neither of them provide better protection against misappropriation than free culture licenses. The ND clause survives on the idea that rightsholders would not otherwise be able protect their reputation or preserve the integrity of their work, but all these fears about allowing derivatives are either permitted by fair use anyway or already protected by free licenses. The NC clause is vague and survives entirely on two even more misinformed ideas. First is rightsholders’ fear of giving up their copy monopolies on commercial use, but what would be considered commercial use is necessarily ambiguous. Is distributing the file on a website which profits from ads a commercial use? Where is the line drawn between commercial and non-commercial use? In the end, it really isn’t. It does not increase the potential profit from work and it does not provide any better protection than than Copyleft does (using the ShareAlike clause on its own, which is a free culture license). The second idea is the misconception that NC is anti-property or anti-privatization. This comes from the name NonCommercial which implies a Good Thing (non-profit), but it’s function is counter-intuitive and completely antithetical to free culture (it retains a commercial monopoly on the work). That is what it comes down to. The NC clause is actually the closest to traditional “all rights reserved” copyright because it treats creative and intellectual expressions as private property. Maintaining commercial monopolies on cultural works only enables middlemen to continue enforcing outdated business models and the restrictions they depend on. We can only evolve beyond that if we abandon commercial monopolies, eliminating the possibility of middlemen amassing control over vast pools of our culture. Most importantly, though, is that both clauses do not actually contribute to a shared commons. They oppose it. The fact that the ND clause prevents cultural participants from building upon works should be a clear reason to eliminate it from the Creative Commons license set. The ND clause is already the least popular, and discouraging remixing is obviously contrary to a free culture. The NonCommercial clause, on the other hand, is even more problematic because it is not so obvious in its proprietary nature. While it has always been a popular clause, it’s use has been in slow and steady decline. Of course, as they note, the NonCommercial clause is still used pretty frequently -- though often without much thought given to why. The site suggests that perhaps those clauses could actually be rebranded or moved out of Creative Commons directly, to keep CC more focused on true open culture efforts. It's an interesting proposal all around, and we're already seeing a fair bit of buzz about it. It will be worth watching to see if it really gets any traction. As part of the Pledge, Blackboard promises never to pursue patent actions against anyone using such systems including professors contributing to open source projects, open source initiatives, commercially developed open source add-on applications to proprietary products and vendors hosting and supporting open source applications. Blackboard is also extending its pledge to many specifically identified open source initiatives within the course management system space whether or not they may include proprietary elements within their applications, such as Sakai, Moodle, ATutor, Elgg and Bodington. Commitments to limit potential patent protection are uncommon, particularly for enterprise software companies. The Patent Pledge -- in terms of its sweeping scope, strong commitment and public nature -- is unprecedented for a product company such as Blackboard. Blackboard Inc. today announced a series of new initiatives to provide greater support for open education efforts. Working with Creative Commons, Blackboard will now support publishing, sharing and consumption of open educational resources (OER) across its platforms. The company also updated its policy confirming the ability for education institutions to serve non-traditional users with Blackboard Learn� without incurring additional license costs. Support for OER enables instructors to publish and share their courses under a Creative Commons Attribution license (CC BY) so that anyone can easily preview and download the course content in Blackboard and Common Cartridge formats. The new functionality is available now for CourseSites, Blackboard�s free, fully-hosted and supported cloud offering launched a year ago and now used by over 18,000 instructors from nearly 12,000 institutions in 113 countries. Similar support for OER will be available soon for Blackboard Learn. Blackboard also clarified its license policy to formalize the ability for education institutions to extend course access in the Blackboard Learn platform � as well as ANGEL and WebCT � to non-traditional, non-revenue generating students at no additional cost. The move supports engaging wider use of the platform to serve different types of �guest� users taking part in efforts including open teaching initiatives, auditing and accreditation activities, student recruiting programs, community outreach programs and collaborative research efforts. The first part of this announcement is about open formats. Blackboard users can now share courses using the liberal Creative Commons license CC-BY, or the Common Cartridge standard. The second part is a classic play by a proprietary vendor trying to stop users moving to open source solutions by offering zero-cost options for certain classes of use � in this case, "non-traditional, non-revenue generating students". Both are testimony to the continuing shift to openness in education, and the rise of key open source e-learning programs like Moodle and Sakai. Although Blackboard's announcements are welcome, particularly its support for the CC license, they are unlikely to halt that trend. That's because moves to truly open formats and open source are not just about cost, but also about freedom from lock-in and the ability to adapt solutions to local needs � something that Blackboard's proprietary approach does not allow. The only way the company can counter those strengths is by going totally open itself.